Google's Social search is now fully implemented within the SERPs (search engine results pages) for every user with a Google account who is signed in. The supposed beauty of social search is that the SERPs will display related search query content from your "friends", as well as the standard Google index results. Interestingly this works through Google making associations from your Social Graph. (basically hyper-links you have created to other sites/people). It's an interesting move and an inevitable one by Google especially considering that a recent research report by Econsultancy/ExactTarget states that 70 percent of companies plan to increase their social media marketing budgets in 2010. Google is fully aware that Social is playing an increasingly important role in how we use the web, not so much in how we actually search, but how we spend time on the web. Indeed with our "friends" content starting to appear in our SERPs it might just the ticket to solve that pressing question that only a "friend" might know. However you look at this development there are many implications for businesses including the fact that we can no longer rely on Google's standard index for SERP traffic. 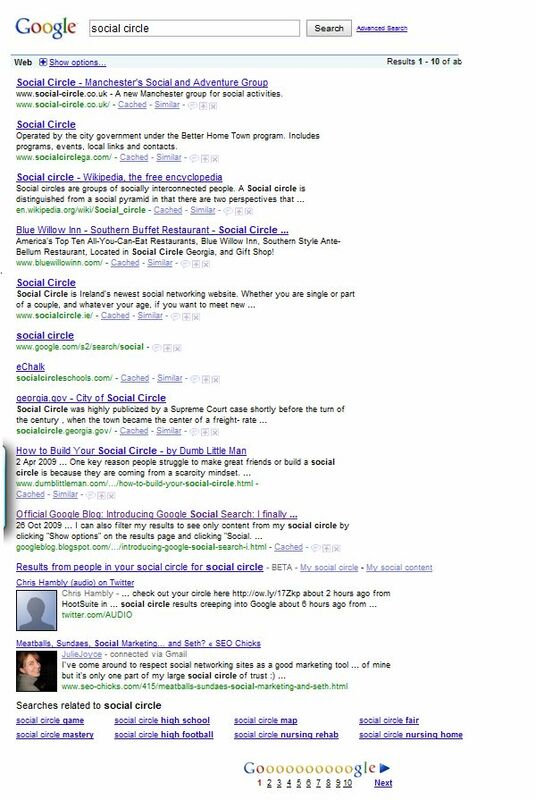 Admittedly the Social Search results are "below the fold", as can be seen from the image I have included here for a search query "social circle". You'll see two entries at the bottom of the page, one is my own tweet, and one is from an SEO friend of mine Julie Joyce. Below the fold placement in SERPs is well known for driving significantly fewer clicks by some magnitude, but this is a beginning and certainly one to watch. If you start to see your friends' faces appearing your search, your eyeballs may well be drawn to that area I believe. The Google blog explains what they are up to.